Emails have become a very important way of communication in the corporate world of today. In one day, professionals exchange a number of formal emails. However, most of the time we forget to convey common courtesies through our emails. These small mistakes make a big difference and can impact an individual’s professional image. When you are drafting an email, there must be a presence of opening and closing greetings for the person whom you are sending this email. The recipient should be impressed and feel that the writer is concerned about him/her. It conveys your respect and politeness to the reader and he/she may get interested in reading your email. Here you have to understand whether you are sending an email to the reader for the first time or whether your recipient is a high authority or a colleague or client, so that you can mention accordingly. While closing an email, you are supposed to mention 'Thanks and Regards’ as the reader has given his/her precious time to read your message. Dear Sir/Madam (only used if you have that much of close rapport with your boss, this can be used for customers as well viz. Dear ABC). ‘Thanking You’ at the bottom left corner immediately after ending up your message. And, below that there should be the presence of your name along with a designation in the ‘Regards’ section below the greetings. Chirag Singh – Marketing Manager. 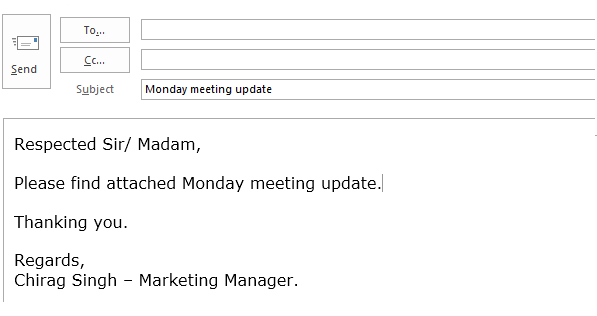 Many of us tend to avoid or forget to change the subject line while sending an email. The subject line should be proper and concise. There must be an addition of required, but limited words, which must showcase to the reader that ‘what exactly the sender wants to convey from this email’. While writing an email to any higher authority, tone of your writing matters a lot. The insertion of ‘ALL CAPS’ in your message shows rudeness and anger to the reader. It really affects a lot on your professional impression. Therefore, avoid using all capital letters. Use of ‘Bold’ should be avoided too, unless you are ready to stand by that point. Always read your message once before pressing the send button. While giving any intimation regarding your family or personal information, do not share too many personal details. The reader is not interested in learning about your personal life (like name of your brother or sister). Value other people’s time and state just the most important details, worthy to be communicated. Unless what you want to convey is applying for everyone, respond only to the sender whom you actually want to intimate about a certain message. There is no use of replying to other people who are not the part of the message. Hope the above explanation will help you draft a professional email in the right format. It is important that you keep these points in mind and avoid the above mentioned common mistakes in an email communication. You can join our online spoken English tutorials and improve your spoken and written English. eAgeTutor.com is the premier online tutoring provider. eAge's world-class faculty and ace communication experts from around the globe help you to improve in an all-round manner. Assignments and tasks based on a well-researched content developed by subject matter and industry experts can certainly fetch the most desired results for improving spoken English skills. Overcoming limitations is just a click of mouse away in this age of effective and advance communication technology. For further information on online English speaking course or to experience, the wonders of virtual classroom fix a demonstration session with our tutor. Please visit www.eagetutor.com. Contact us today to know more about our spoken English program and experience the exciting world of e learning. 1. How to Introduce Yourself Professionally in 1 Minute? 2. How To Speak About Your Strengths In 1 Minute? 4. How to Speak About your Weakness in 1 Minute? 5. How to disagree politely?